Marginal Revenue is the revenueSales RevenueSales revenue is the starting point of the income statement. Sales or revenue is the money earned from the company providing its goods or services, income that is gained from the sale of an additional unit. It is the revenue that a company can generate for each additional unit sold; there is a marginal costMarginal Cost FormulaThe marginal cost formula represents the incremental costs incurred when producing additional units of a good or service. The marginal cost formula = (change in costs) / (change in quantity). The variable costs included in the calculation are labor and materials, plus increases in fixed costs, administration, overhead attached to it, which is to be accounted for. For example, Mr. A sells 50 packets of homemade chips every day and he incurs some cost to sell and produce them. He determined the price of each packet to be $5, adding all the cost and his profit, where his profit is $1.50 per packet. Now, Mr. A produced 55 packets one day by mistake and took all of them to the market. With no surprise, he was able to sell all 55 packets for $5 each. He made his usual $250 by selling 50 packets. In addition to that, he sold 5 packets, which were produced by mistake. He was selling the packets for $5 and since he sold 5 additional packets, he had a Marginal Revenue of $25 ($5 x 5). This is how Marginal Revenue is calculated. It is dependent on supply and demand, and on the type of market as well, such as Perfect Competition and MonopolyMonopolyA monopoly is a market with a single seller (called the monopolist) but many buyers. In a perfectly competitive market, with a large number of sellers and. In the image above, you can see three curves: Marginal Revenue, Average Revenue or Demand, and Marginal Cost. Let us examine the concept of Marginal Revenue in greater detail. The Marginal Cost curve is a “U” shape curve because the marginal cost for 1-5 additional units will be less and with more incremental units, the marginal cost will begin to rise. The Marginal Revenue curve is sloping downwards because, with one additional unit sold, we would generate revenue close to our normal revenue but as we start selling more and more, we would require reducing the price of the item we are selling. Otherwise, we will not be able to sell it, which is also known as the law of diminishing margin. So, the more you sell after a normal limit, the more the price will diminish and so will the revenue. 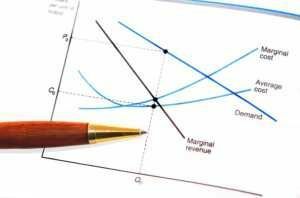 There is an Average Revenue curve or Demand curve, which is not the consumers’ demand curve but rather the producers’ demand curve. The curve represents average quantity at an average price. Now that we understand what these curves are and what their function is, let us discuss marginal revenue in the context of marginal cost. Let us say Mr. X is selling boxes of candy. He sells 25 boxes every day for $2 each and makes a profit of $0.50 on every box that he sells. Now, due to an increase in demand, he was able to sell 5 additional boxes of candy for the same price. He incurred the same cost, which leaves him with the same amount of profit on these boxes as well, which will add up to $2.50 ($0.50 x 5). Mr. X calculated that he could sell even more boxes of candy, so he ordered 10 more boxes. Now because of government restrictions and limited production, the cost of each box after the 30th box increased by 10%, which made the 5 additional boxes of candy cost $1.65 each. His total cost = (30 boxes @ $1.50 = $45 and 5 boxes @ $1.65 = $8.25) total cost = $45 + $8.50 = $53.50. Now he went to the market and tried to sell those candy boxes for the normal price of $2 each for the first 30 boxes and after that, he priced each box of candy for $2.15. He could sell 30 boxes easily and was not able to sell the remaining 5 boxes at the price he determined. In order to sell the remaining boxes, he needed to reduce the price to the normal price, otherwise, people would buy them from some other seller. He sold his remaining 5 boxes for $2 and had a diminishing marginal return on those 5 boxes. This is how marginal cost and diminishing marginal returns work with the marginal cost taken into account. In the competitive market or perfect competition, the Marginal Cost will determine the Marginal Revenue and in a monopoly market, the demand and supply determine the Marginal Revenue. Marginal Revenue is easy to calculate. All you need to remember is that marginal revenue is the revenue obtained from the additional unit sold. The formula above breaks into two parts: one, change in revenue that means (total revenue – old revenue) and two, change in quantity, which means (total quantity – old quantity). Example: Mr. A used to sell 10 pencils and now he is selling 15. Earlier, his total revenue was $20 and it is now $28. Putting the values in the formula change in revenue = $8 and change in quantity = 5 pieces, so, $8/5 = $1.60, which is his marginal revenue per additional unit sold.